This article describes the purpose of the contact log, who can access it, and how to enter information. The Contact Log is a tab that exists on the clinical cases of clients and groups. The Contact Log is a great tool to log any and all communication that takes place outside of a regularly scheduled appointment. Click on Notes under the Actions column. If it's a Group Case you will have the opportunity to log the contact under the desired client from the case. Next to Client Details click on the client's name to see other options. Client Details: This will show you the name of the client you are entering the note for. Date/Time: This should be the dates and time the contact took place. Means of Contact: Enter what form of communication was used: Phone, text email, etc. Note: Summary of the communication. Example: Did intro call with client to discuss documentation that needed to be completed. Client said they would complete the paperwork needed. Relationship to Client: This is where you can log if the communication was indeed with the client or another person such as the Parent, Spouse, or another Therapist. Staff: should be the staff member who received the communication. 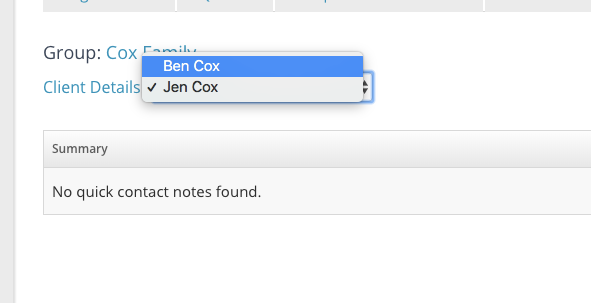 Only staff members assigned to the case will show in the drop down. You can then save your contact log entry. You can also click on the down carrot option to Save and E-Sign. If you sign the note the note cannot be edited and signature cannot be removed to make edits.